Hello everybody and thanks for coming back again! Today we are going to be talking about frequencies and the radio spectrum in general. First off lets talk a little bit about the radio spectrum in general. The spectrum ranges 1 Hertz(Hz) to 10 to the 26th power Hz. Before we go any further, what is a Hertz? Hertz is the unit of measurement for determining the frequency of a wave. It is how many times a wave will pass in one second. One wave or Hertz is from the point where the wave crosses the center line, goes up then down below the line and back to the center line, as you can see what it says Wavelength on the image above. 1 Hz means that the wave will pass one time in a second. At 146 MHz, which is right in the middle of the 2 meter amateur band, the 146 Million waves will pass in one second! The easiest way to remember on how frequencies work in relation to distance is, Lower Longer, Higher Shorter! the Lower the frequency the farther or longer the wave will travel in one cycle. Lets look at a couple examples on both ends of the spectrum. The 20 Meter amateur band, has a wavelength of approximately 20 meters or 65.6 feet per cycle. On the 70 centimeter band, one wavelength is about 27.5 inches long in one cycle. The audio portion of the spectrum is from 20 Hz to 20,000 Hz. Anything below 20Hz is generally felt rather than heard. 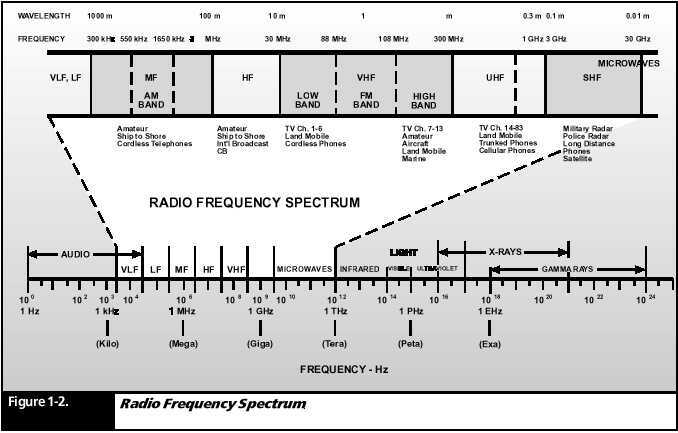 The radio portion of the spectrum is from 20KHz to 30 GHz. Above 30GHz is where infrared, visible light, ultraviolet light, X-Rays and Gamma Rays reside. For the purposes of amateur radio, we are mainly just concerned with the 20KHz to 30 GHz range. So lets talk about a little math. I hope that yall have found this information interesting, or at least helped you remember a little bit more about basic amateur radio information. If anyone has any questions over what we have covered today, please leave a comment below. Thank you all for visiting my blog today and I hope that you will return for my next post. If you haven’t already, please like my facebook page, and/or follow me on Twitter, Google+ or LinkedIn.